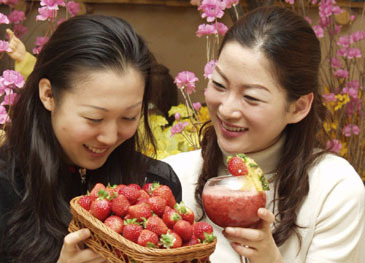 To greet the new spring season, Lotte Hotel Seoul presents their annual "Strawberry Festival" from Feb. 20 to March 17, 2006 featuring delicious strawberry concoctions and a unique treat — a real strawberry garden around the lobby and entrance to The Lounge. At Delica-Hans Sidewalk Café & Delicatessen, Strawberry Cheesecake, Strawberry Tarts, Strawberry Mousse Cake, Strawberry Fluff and Strawberry Nougatine are the specialties of the season, while the Lounge offers Fresh Strawberry Juice and three types of Strawberry Cocktails. Prices range from 14,000~\30,000 won, exclusive of VAT and Service Charges. The other restaurants & bars at Lotte Hotel Seoul will also be serving strawberry desserts and drinks during the event period.